Designers tend to be selective about what pens they use. I've recently fallen in love with fountain pens, but I rarely see other designers using them. A fountain pen is a great addition to a designer's arsenal of writing implements. 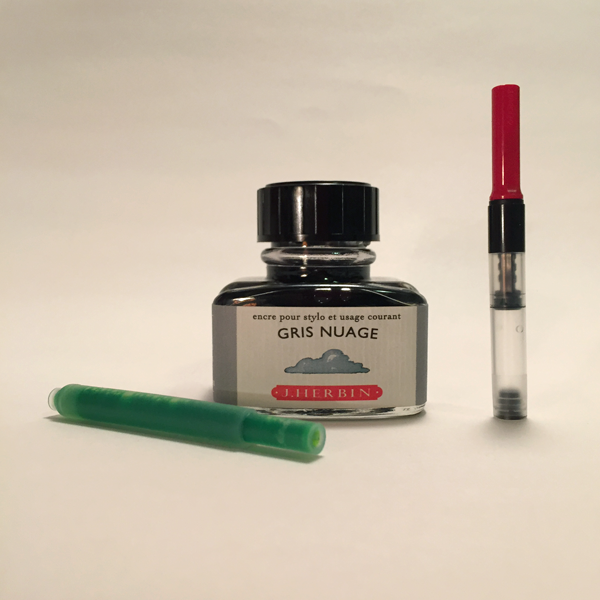 Fountain pens allow you to select a design and color that fits you, a nib that works for your writing style and an unique ink color. If you are a designer thinking about buying a fountain pen, here's a quick guide to getting started. You typically won't find fountain pens at the local Staples or Target. Online retailers like Goulet Pens or Pen Chalet offer a wide range of brands and styles. Depending on where you live, a local specialty store may be an option. There isn't a store here in Columbia, but there's a great store up the road in Asheville, NC. The obvious benefit of buying from a store is being able to see and try things out and talk to a knowledgable staff. Fountain pens range in price from a few bucks to hundreds of dollars. You'll find pens made from just about every material -- from plastic to gold. The least expensive pens are disposable, but the real fun comes with reusable pens. At first the number of choices can be overwhelming, but there are lots of resources online where you can research your options. I'd start with a blog like the Pen Addict, where they review pens and inks. The online retailers like Goulet Pens have blog posts detailing options for beginners. There are pens for every design aesthetic. Clean and machined. Ornate and classic. Simple and practical. And everything in between. Some pens are skinny and light and others are more substantial. Lamy safari in Lime Green with a Fine Nib. My first fountain Pen. Pick something that matches your personal style. I decided to start with a Lamy Safari. It's on all the beginner pen lists and comes highly recommended. A Safari costs about $30 -- not the cheapest entry level pen, but still affordable. Easy to use, writes wonderfully and comes in a number of colors and nib styles. I also own a Lamy AL-Star, which is similar in design to the Safari, but aluminum. FYI: Podcasts and blogs sometimes offer discount codes that will save you 10% to 15% off your purchase. The writing point of a fountain pen is called a nib. While each manufacturer classifies their nibs a little differently, they typically start at Extra Fine and go through Broad. You can also get a calligraphy nib. Fine Nibs on a Lamy Safari and a Lamy AL-Star. Many pens have interchangeable nibs, which is great if you aren't sure what kind of nib you'll like. I started with a fine nib and I'm now looking forward to trying out some different options. Lamy offers a bunch of nib options for my Safari and AL- Star. Personally, I'd like to pick up a broad nib and a calligraphy nib to play around with lettering styles. One of the best things about fountain pens is the wide variety of inks available. All sorts of colors are offered, from traditional colors like black and blue through less traditional options like purple and green. You can get permanent, waterproof inks, fast drying inks and even specially inks with odd color properties or embedded gold flakes. Some pens companies use cartridges, like Lamy or Pilot. They offer a limited number of colors in easy to replace cartridges. If you buy a cartridge pen, you can often buy a converter (only about $5) that allows you to use any fountain pen ink you like. Many beginner pens use Ink cartridges, like the green one above. A bottle of ink can be used with a converter, far right, to use bottled inks with cartridge pens. When you buy online, it's sometimes tough to tell what an ink is going to look like. There is no Pantone guide for ink colors, so it's a little bit of trial and error. One of the first inks I purchased was a neon green, which is actually more of a highlighter ink. Oops. I've got another ink that is grey and looks like pencil when it dries. Changing ink colors requires you to clean out the previous ink. It's an easy process, but you need to let the pen dry before you add the new ink. What kind of paper should you use? If designers are particular about their paper, then fountain pen fans are fanatical. Writing with a fountain pen is a different experience than writing with a quality gel ink pen. Ink dries a little more slowly and can bleed through the page. You will find no shortage of opinions on the best papers for use with fountain pens. I still use a Moleskine for note taking, although many folks feel there are better options. Some folks love designer-favorite Field Notes while others feel the paper is too thin. I have a new Rhodia pad that works great with a fountain pen. In general, thick paper with a smooth surface seems to work better. My recommendation is to try paper, notebooks and pads that you like and see what you think. It all comes down to personal preference. I know many designers that hate their handwriting. I think we hold ourselves up to a standard of artistic perfection. I'm one of those people that can't stand my handwriting. (That's why I design typefaces.) But I can honestly say that after writing for a few months with a fountain pen, I'm starting to like my handwriting again. I don't know if I'm just paying more attention to my handwriting or if the better pen really makes a difference. I seriously have no idea. But I enjoy writing on paper now, and that's something that hasn't been true for a long time. But I like my current pen. It's not an "either or" decision. A fountain pen is great for writing. I prefer the gel pens for sketching out concepts. And you'll still need a Sharpie because everyone needs a Sharpie or two in their bag. Bonus: Using a reusable fountain pen means you aren't throwing away as many disposable pens, which is obviously a good thing. Be prepared to talk about your choice of pen when you head to meetings. A fountain pen rarely goes unnoticed. Once you start with a nice fountain pen, you won't want to go back. Obviously, you'll probably want to experiment with different pen types and inks. Companies offer whole ranges of cases and accessories for fountain pen users. And if you get really serious, there are services and vendors that let you customize pens and nibs. Blogs like the Pen Addict and edjelley.com are a great place to start. Retailers like Goulet Pens and Jet Pens all have blogs that detail new products and review pens, inks and accessories. Many pen and ink manufacturers also have blogs. I love the Pen Addict podcast. It's one of my favorites. So if you listen to podcasts and are interested in pens, it's one you should check out. I'm still pretty new to the fountain pen addiction, so if you have questions or discover something cool, please mention it in the comments below or shoot me a note on Twitter at @sketchbookb.